Lady and the Blog → Living → Who Will Win The Battle of the Medicine Cabinet? Both Of Us! Who Will Win The Battle of the Medicine Cabinet? Both Of Us! 5 people and two baths. Let me make a correction. 5 people (and one of them is a beauty product junkie) and two baths. Ok, that certain someone is me. Needless to say, our shelf space is limited because I need to test out all the dry shampoo (and mascara, and red lipstick and eye cream) that comes on the market. I’m turning 40 next year! I need all the eye cream!!! While I have a full bath, it is a TIGHT SPACE. I live in NY – Long Island to be specific. We actually had to take a few feet from my closet when we moved into our home in order to blow out the bathroom a bit. My husband literally couldn’t turn around in the original design. It was a super tiny triangle. I’m not sure how the former owners survived! Today, we make due – with limited shelf space and limited room to breath. Luckily, I’m from NYC and lived in a 1 bath apartment my entire life. So, this current house is actually a MEGA upgrade! Either way, there are a few tricks up our sleeves to make our home space work for the two of us. Lubriderm conducted a study and found out that Americans are struggling to win the “Battle of the Medicine Cabinet”. There is a way to save on bathroom storage space and it really is so simple! 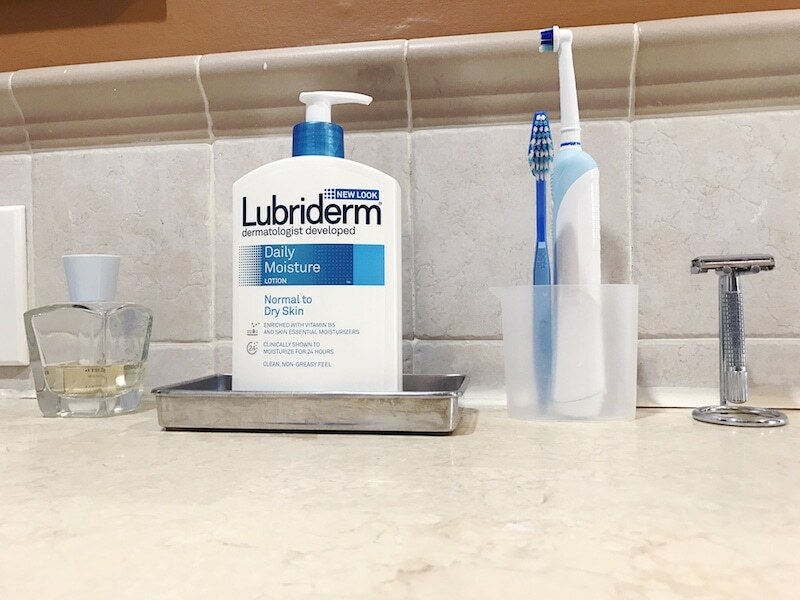 Use unisex products like Lubriderm – that way everyone’s needs are met while minimizing the amount of shelf space used. Think about it. Bill and I both have dry skin and depending on the time of the year, we both suffer from patches of irritation. Normal skin feels healthy but occasionally gets dry. 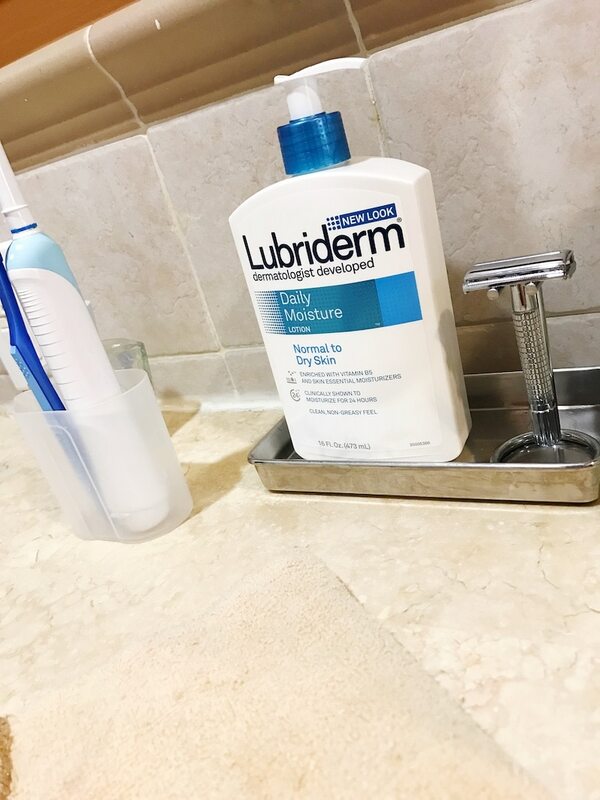 Lubriderm is a lightweight, non-greasy, everyday lotion that contains Vitamin B5 and skin essential moisturizers naturally found in healthy skin. 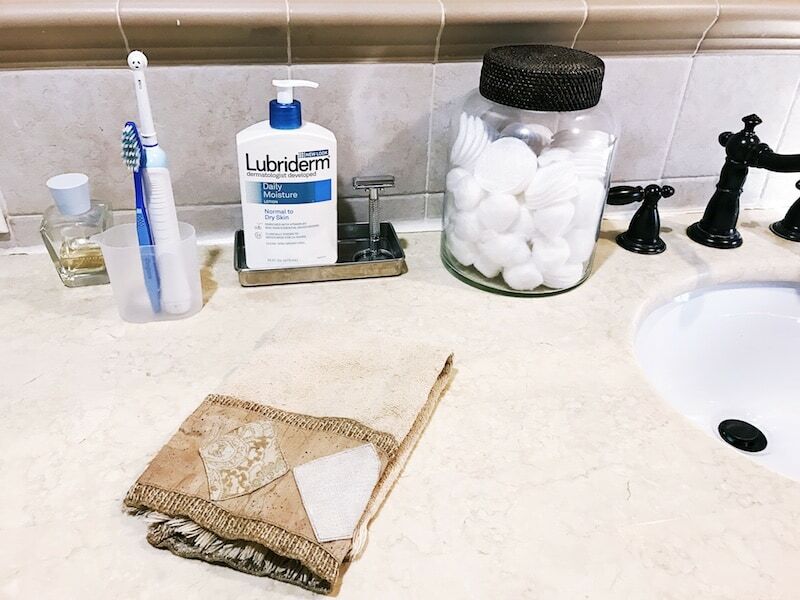 What Lubriderm Lotion Will Work For You? 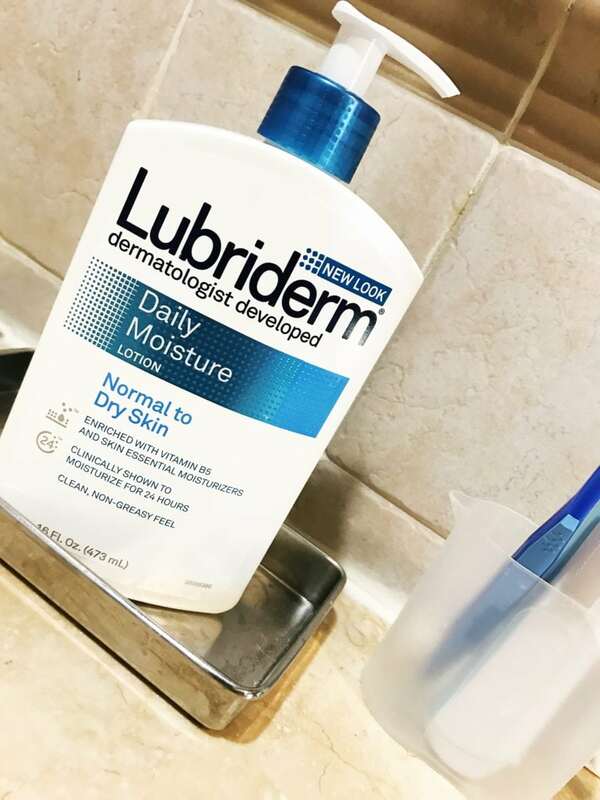 LUBRIDERM® Daily Moisture Lotion: Specially formulated, this lotion contains vitamin B5 and other skin essential moisturizers naturally found in healthy skin to improve the moisture barrier for visibly healthier skin. The lightweight formula helps relieve dry skin and prevents dryness from reoccurring throughout the day, leaving skin feeling soft and smooth. LUBRIDERM® Daily Moisture Lotion Fragrance Free: An unscented version of the Daily Moisture Lotion, this formula provides optimal hydration while reducing the risk of skin irritation. LUBRIDERM® Daily Moisture with SPF 15 Lotion: A powerful two-in-one moisturizer and sunscreen that hydrates skin with essential moisturizing ingredients, while providing broad spectrum UVA and UVB protection with an SPF 15. This clean non-greasy lotion is perfect for everyday use to achieve smoother, healthier-looking skin. LUBRIDERM® Daily Moisture Lotion for Sensitive Skin: Specially formulated for sensitive skin. This gentle moisturizer is 100% fragrance-free, dye-free and lanolin-free, which helps to protect dry, sensitive skin. The non-irritating formula creates a protective moisture barrier on the skin’s surface, leaving skin smooth, comfortable and protected. Vera: This interview couldn’t come at a better time. We are currently redoing our entire house! 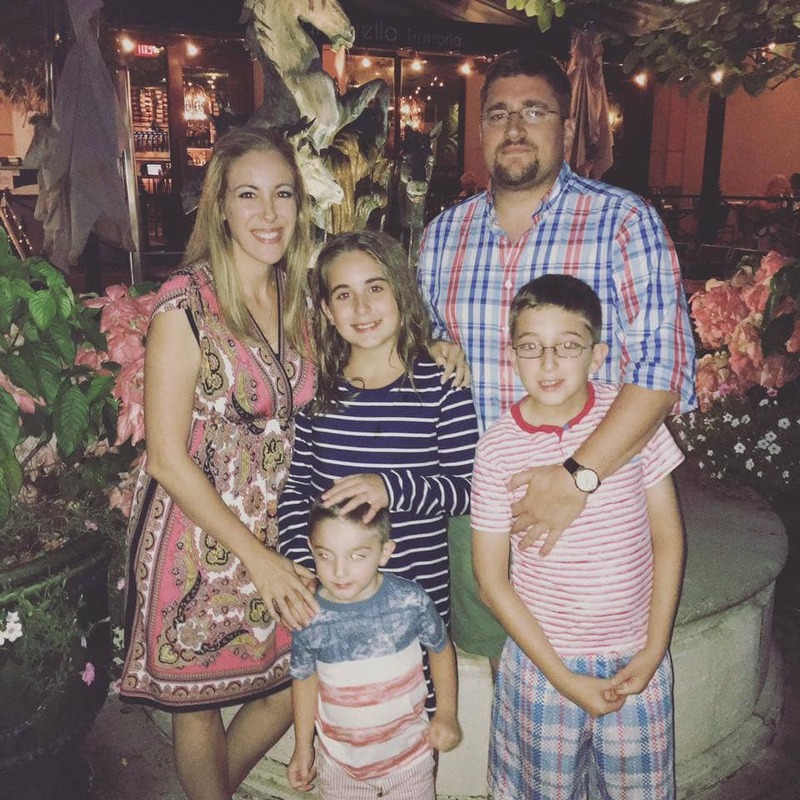 My husband and I work from home and we need a way to manage all the incoming mail for our business. We don’t have an enclosed office and have a pretty open floor plan. Any tips for managing shipments and regular mail? I really can’t stand to look at our chaos anymore. Erica Domesek: First things first. If you can’t organize your mail, let you mail organize you! 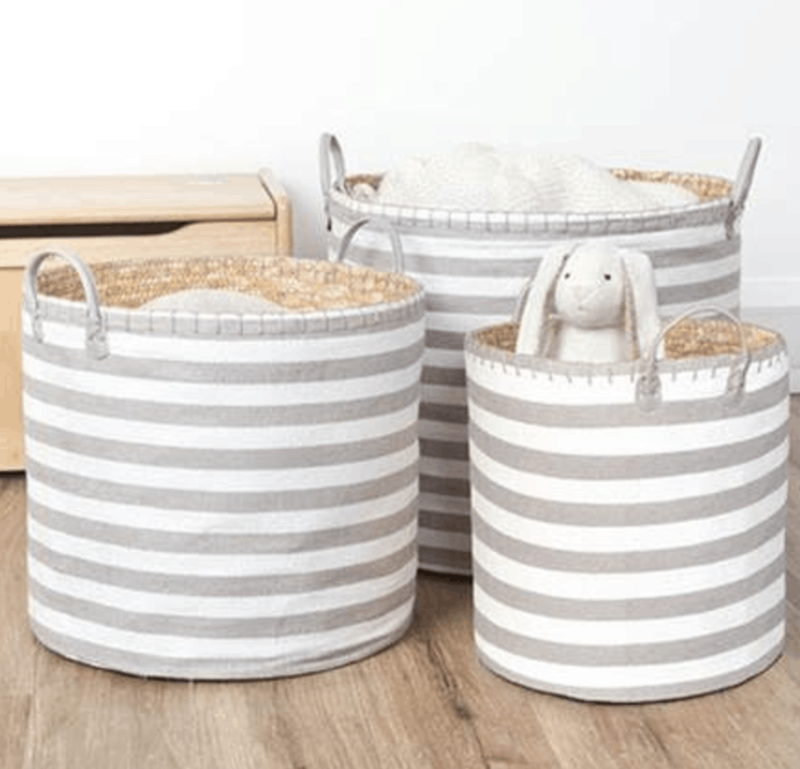 Find a storage solution, (think cubby, hanging mail organizer, wire baskets) where you can separate his/her mail into business, personal, magazines, bills, etc. Don’t worry about going though everything the second it arrives in the mail, but as long as you trash what doesn’t need to be kept (think grocery store circulars) and find a place to sort business and personal mail when you get a chance, it will make you feel more organized, rather than one giant pile of mail sitting on the kitchen table that keeps piling up. Vera: My beauty products are taking over our small bathroom. This is the truth! I brought in a huge wicker basket piece and it is now full to the rim. I know the answer is to edit down, but do you have any other options for managing our beauty/grooming products and toiletries in the bathroom? Erica Domesek: You are correct- you need to edit your beauty supplies first and foremost. We are all guilty, so just know you’re not alone. If you haven’t used a lipstick (etc.) in at least 6 months, then toss it! 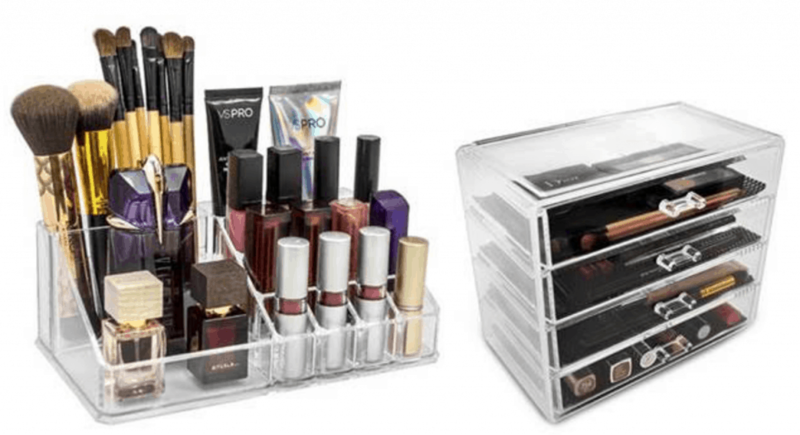 As soon as you free up space, highly recommend investing in some acrylic containers that will only allow a certain amount of space for products, so you won’t be able to hoard anymore. Sorry, Charlie! A basket allows you to throw in whatever you want and does not keep you organized. Clear containers are great because you can see through them, and don’t have to dig like you’re currently doing. Vera: Toys. Toys. Toys. We have three children and I feel like they are taking over our entire space. Can you offer some advice for parents who are ready take control back of their homes? Vera: Our line closets are always a mess. Our hallway closets are always a mess. Is it worth it to have them professional designed and configured? I just don’t feel like we are making the most use of what we have. Erica Domesek: If you can’t seem to figure out a system and clothes are everywhere, sounds like you need reinforcement. It’s a small price to pay for a clear mind and a clear hallway. A lot of people do not realize that they are not utilizing the space in their closets efficiently until they get them professionally designed. Having double bars and shelving in a closet sounds just what the design Doctor ordered for ya! Trust me when I say, I have been there- when I moved into our house it was the very first project I ever did. Such great advice!!! How do you manage living with your significant other? Do you have any tips or tricks that you’d like to share? Would love to hear your thoughts! Those are great tips for staying organized. Our medicine cabinet – our bathroom in general, actually – looks like a bomb went off in there. We also have a very small bathroom. We do have a medicine cabinet but it is not a big one. We need to organize better ourselves. I am pretty sure these tips will help. I love Lubriderm lotions. We have 5 people and currently 1 fully functional bathroom. Let’s just say the bathroom space is VERY limited! I personally like the Lubriderm lotion for sensitive skin and SPF15 for summer. Organizing bathroom is my thing I like my bathroom neat.